General Hospital (GH) spoilers tease that Shiloh Archer (Coby Ryan McLaughlin) will continue to make enemies and stir up trouble for the ones he already has. GH fans can expect Shiloh’s behavior to grow increasingly dark over the next few weeks. As Shiloh’s relationship with Kristina Corinthos-Davis (Lexi Ainsworth) deepens, she’ll land in grave danger and so will those who work to save her. Of course, we’re talking about Sam McCall (Kelly Monaco) and Jason Morgan (Steve Burton). Once Sonny Corinthos (Maurice Benard) returns home from Turkey, he’ll be pulled into the chaos, too. General Hospital spoilers say Sonny and Alexis Davis (Nancy Lee Grahn) will team up to find some sort of solution soon, but it’s doubtful they’ll figure one out. Things will get much worse before they get better. Oscar Nero (Garren Stitt) also reached out to Shiloh recently about alternative treatments. That keeps Drew Cain (Billy Miller) and Dr. Kim Nero (Tamara Braun) in Shiloh’s orbit. There’s even a chance the rest of the teen scene could become part of this. Cameron Webber (William Lipton) tends to be skeptical, so he may step up for Oscar with the help of Josslyn Jacks (Eden McCoy). We’ve also got Daisy Kwan (Kelsey Wang) and Margaux Dawson (Elizabeth Hendrickson) involved here. Plus, General Hospital spoilers say Shiloh is likely Willow Tait’s (Katelyn MacMullen) “baby daddy.” If Shiloh is indeed the real Wiley Cooper-Jones’ father, he could make a mess for Willow and everyone tied to the baby swap plot – including Brad Cooper (Parry Shen) and Michael Corinthos (Chad Duell). Even Harmony (Inga Rademacher) could turn against Shiloh in the end. Bottom line, all roads lead to evil Shiloh and that may be his downfall. So many people will be out to get this GH villain eventually. Does he stand any chance of making it out of Port Charles alive? General Hospital could have a deadly exit in the works at some point. Will this turn into the show’s next big murder mystery? The Ryan Chamberlain (Jon Lindstrom) story was great, but we knew exactly who was doing the killing. 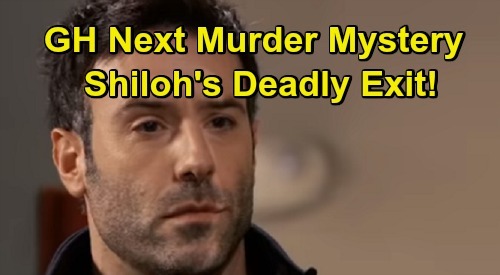 It’d might be fun for General Hospital to mix it up and have a secret killer for Shiloh. There’d certainly be no shortage of suspects based on the list we already came up with! General Hospital can’t just let Shiloh waltz out of PC without consequences. Redemption doesn’t seem to be much of an option either – at least not after all the nasty things he’s about to do. With that in mind, a grim fate may be the only possible outcome. It sounds like Shiloh will have to watch his back as this Dawn of Day story moves forward. We’ll give you updates as other GH news comes in. Stay tuned to the ABC soap and don’t forget to check CDL often for the latest General Hospital spoilers, updates and news.